This guide is meant to provide guidance for those developing or managing a project or programme to engage men in sexual and reproductive health and rights. 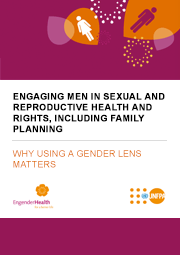 It emphasizes the importance of using a gender lens when planning and programming men’s engagement in sexual and reproductive health and rights, including family planning – which means engaging men as clients of sexual and reproductive health services, as supportive partners, and as agents of change. This guide is based on the premise that gender norms and how men and women express them can affect their sexual and reproductive health behaviour. Likewise, the gender attitudes and beliefs held by programme staff and health-care providers (doctors, nurses, etc.) can have an impact on how they design programmes and how they provide services. Assessing, reflecting on and/or challenging gender norms should be a fundamental part of any intervention which seeks to improve sexual and reproductive health, including the involvement of men. To access this guide, click on the image below.